LONDON (Reuters) - Iranian vice president Eshaq Jahangiri acknowledged on Tuesday that U.S. sanctions would hurt the economy but promised to "sell as much oil as we can" and protect its banking system. Jahangiri said Washington was trying to stop Iran's petrochemical, steel and copper exports, and to disrupt its ports and shipping services. "America seeks to reduce Iran's oil sales, our vital source of income, to zero," he said, according to Fars news agency. Jahangiri said it would be a mistake to think the U.S. "economic war" against Iran will have no impact, but added: "We will make Americans understand this year that they cannot stop Iranian oil sales." 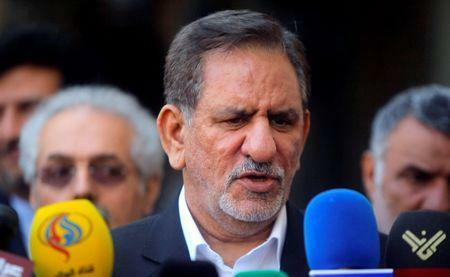 "We think the Europeans will act in a way to meet the Iranian demands, but we should wait and see," Jahangiri said. The pressure on Iran came as Washington had launched an "economic war with China and even its allies", he said, referring to trade tensions between the United States and many of its main trading partners.